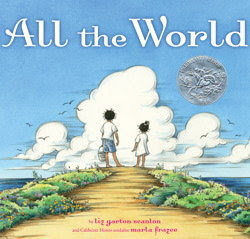 All the World by Liz Garton Scanlon and Marlee Frazee. Beach Lane Books, an imprint of Simon & Schuster. 2009. Picture Book. Caldecott Honor Book. The Plot: A family is at the beach: "rock, stone, pebble, sand/ body, shoulder, arm, hand/ a moat to dig/ a shell to keep/ All the world is wide and deep." The family goes about its day and a host of other characters are depicted. At the end, they are together, one community, one world: "Everything you hear, smell, see/ All the world is everything/ Everything is you and me/ Hope and peace and love and trust/ All the world is all of us." The Good: Really, it would be easier to say what isn't good. Um, except it's all good. The poem itself is deceptively simple; describing a day in the children's lives, but also describing all of us. It shows what we share and have in common. The illustrations (pencil and watercolor) reflect the text and deepen it. They are full of details; each time you read the book, you see something new, a new connection. When does part of one scene appear in another? What people appear and reappear in the illustrations? It's more than a guessing game, a searching game. It underscores how we are all connected. The family and people in the book reflect our world: different colors, different shades, different ages. It's not a big deal, in that it's not part of the text or done with a "look! look! look!" feel; it is a big deal because we need to have and see multicultural families in books, and yay, here is a beautifully illustrated one with two children of color on the cover. I hesitate to say "what a great message," because message books are usually heavy handed. This is not; so I'll say, this book has meaning, and truth, and inspiration. It has reassurance and love. Video and curriculum guide at author's website. I bought this book for my granddaughter, it's a delightful children's book - beautifully woven story - I'll have to wait to hear from her as to what she thinks, but I'd say two thumbs up! Thank you.